Got an organizing dilemma? Chances are, you're not the only one. Check this space for some free professional advice on how to solve common issues, or click the button below to submit your own question. Also check out our Simple Solutions Gallery and follow us on Pinterest (by clicking the button in the upper right corner of this page) for more ideas that will make you say, "Now why didn't I think of that?!!" Q: Do you have any suggestions for putting away strings of Christmas lights? I always get them so tangled they are a bear to get apart the next year. Any suggestions you have would be greatly appreciated. - Victoria B. A: I would suggest wrapping each string around one of those cardboard tubes from the center of a roll of paper towels, toilet paper or wrapping paper. You can even cut a small notch in one end of the tube to tuck the end of the string in so that it stays wound. This also helps you find the end of the string easily when you go to unwrap them next year. Cardboard paper towel tube keeps Christmas lights neat and tangle-free in storage. Q: What's the best way to store all my containers so that the lids don't end up all over the place or lost? - Molly E.
A: First, make sure all of your containers have lids and all your lids have containers to save from wasting time searching for a lid that doesn't exist or wasting space on a containerless lid! 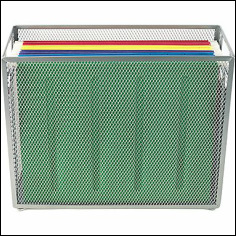 Then "file" all your lids together by size in a small bin or basket so that you can easily see what you have and find the size you need. Nesting the bottoms together saves a ton of space. When purchasing new containers, try to buy in sets whenever possible. This makes it easier to nest them and often the lids are interchangeable for different size containers within the same set. Q: I’m so tired of wasting food that gets lost and forgotten about in the back of my refrigerator. How can I avoid this? -Natalie B. A: There’s an easy solution to this problem! 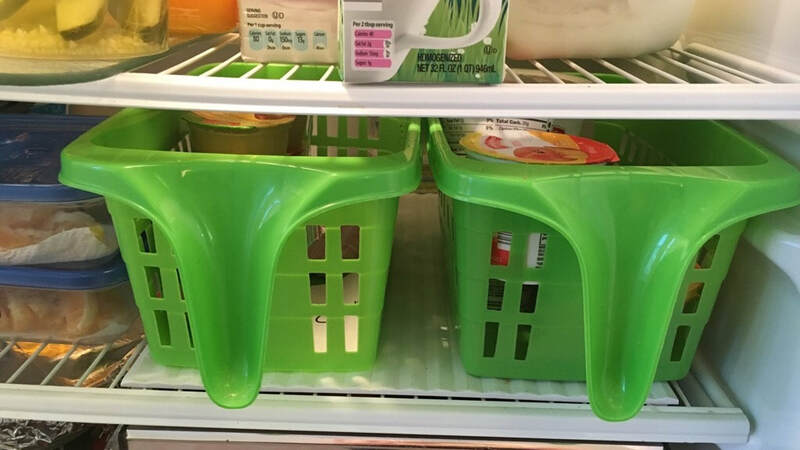 Simply add a few small baskets like the ones below (think dollar store!) to hold small items or containers that might otherwise get lost or overlooked. You can designate each basket for specific categories, such as lunchbox or snack items, yogurts, leftovers, etc. to make it even easier to find things. Q: Is there an easy way to remember what all the laundry care symbols mean on clothing tags? -Claudia R.
A: Yes! Keeping up with your laundry is hard enough without having to guess at this! Print out this PDF from Textile Industry Affairs and post it on your laundry room wall! Q: I'm trying to reduce the amount of bleach and other harsh cleaners in my home, but I love the convenience of having Clorox wipes at the ready to clean up spills in the kitchen. Sometimes I need more than just paper towels. Do you have any suggestions for an environmentally-friendly solution? -Becky Z. A: You don't need bleach to effectively clean up most of the yuckiness that occurs in the kitchen. I like to keep a jar of reusable cleaning cloths on my kitchen counter. All you need is 8-12 clean rags (a pack of 9 at Walmart costs about $3-4), an airtight glass jar, 2 tablespoons castile soap (a version with tea tree oil will give you an added boost of bacteria-fighting power), 3 cups hot water, 1 tablespoon borax (this, along with the vinegar, will help prevent the rags from molding in the jar), and 1 cup vinegar. Mix together the first three ingredients until the borax dissolves and then add the vinegar. Layer half of the folded rags in the jar and pour half of the solution over top. Then add the remaining rags to the jar and pour the rest of the solution over top. Make sure the solution gets evenly absorbed by all the rags. Make sure to start with clean rags and use the hottest water possible. Keep the jar closed and use these up within a week or two. Q: I have a drawer full of tangled chargers, cords and earbuds. How do I keep them usable and neat? -Alicia M.
​A: Ah yes...a common problem in the Information Age! Here are a couple of solutions from our Simple Solutions Gallery that can help. 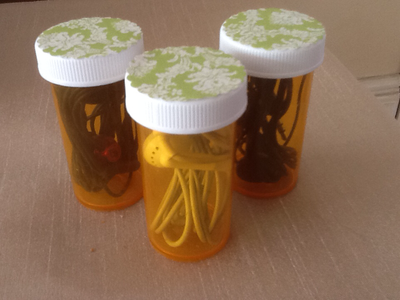 Put those old empty prescription bottles to good use as an earbud container for your purse, backpack or even to keep in a drawer. 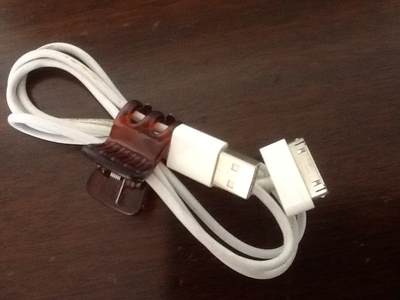 Bundle up cords and chargers with ease using varying sizes of claw clips you can buy at the dollar store. And while we're on the topic of chargers, make sure you label your chargers as soon as you get a new device or while you still remember which device it's for. This helps to avoid that drawer full of mystery chargers you are afraid to throw away! Q: Now that school has started, I'm getting inundated by all the papers my kids bring home in their backpacks every day! How do I keep myself and my kids organized? -Marci R.
Review the completed classwork just to make sure your child is grasping basic concepts. Make note of areas of concern to address with the teacher and/or review with him later, but do not keep completed work except as needed for this purpose. If desired, you can also set aside in a designated keepsakes folder a few pieces of work that are particularly meaningful, but keep this to a minimum! Select artwork for display, discussion, or as keepsakes. You can follow the suggestions given in response to the question below for ideas on how to handle artwork. Most informational fliers and school correspondence can be tossed once you've read them. Those requiring action should be added to your daily To Do/Action pile. File important school information you think you may refer back to later in your reference files. Permission slips should be signed and returned to the backpack immediately, if possible. Otherwise, add them to your To Do/Action pile. You may find a hanging file box like the one pictured below helpful for storing keepsakes, To Do/Action items, and school reference information, as well as any other papers you want to keep close at hand. This hanging file box from Staples ($9.99) can help you triage your daily influx of papers. Q: How do I organize all the artwork my kids are constantly bringing home from school? I can't bring myself to throw them out, but we are being overrun! Help! -Catherine K.
1) Purchase a scrapbook with plastic pages for each child and have them select their favorites to go in this "portfolio" they can proudly take with them to Grandma's house. 2) Establish a gallery wall somewhere in your home where favorite pieces can be displayed for an established length of time, or until a new favorite comes along. This can be in the form of a wire "clothesline", a collection of clipboards, or frames with magnets on the back (used on a magnetic surface, of course) that are easy to switch out. 3) Hang a hinged, glass-covered shadow box on the wall and simply add new pictures to the front of it until it is full. Then have your artist select one or two favorites to keep and eliminate the rest. 4) After displaying the artwork for a set period of time, have your child pick only their favorites (give them a number) to keep in a keepsake box or scrapbook. 5) Take a photo of the artwork before tossing it. These digital photos can be used in a variety of ways to preserve your memories without taking up valuable storage space. There are many apps available that allow you to record the date, artist and a description, as well. 6) Find creative ways to turn the artwork into something useful or use it up, like laminating it to use as a placemat, wrapping a gift in it, or using it as a book cover. Whichever method you use, involving your child in the decision-making process of what to keep and what to pitch is an important step in teaching them how to let go of things and spare them a lifetime of clutter. It also saves you from the guilt of throwing away something if they are the ones making the decision. This gallery wall shown on Pinterest uses inexpensive frames and clothespins to easily switch out masterpieces. Q: I have a whole bunch of dead electronic devices that no longer work. I can't donate them because no one would want them, and I don't feel right just throwing them in the trash. What should I do with them? - Michael K.
A: Great news! Staples will take many broken and outdated electronics, rechargeable batteries and ink/toner cartridges and recycle them for you for FREE. You may even be able to get store credit for some of them. For a fee, they will also pick up from offices with 20+ people. Click here for more details! Q: Can you recommend a way to store Barbie dolls and all their accessories? Right now I shove them all in a bin, but then my daughter has to dump the whole thing to find something. - Katie S.
A: A lot depends on how many you have and how likely your daughter is to maintain the organizational system you set up. I would definitely store dolls, clothes and accessories each in separate drawers or containers. You could try a silverware tray inside a larger bin or a divided storage container similar to the one pictured below for keeping accessories organized. I also love this pocket organizer idea from Pinterest! 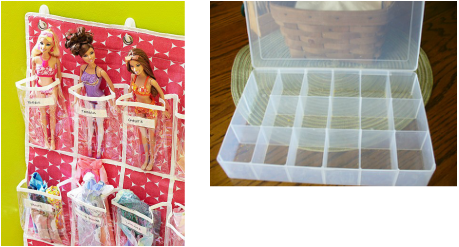 Even Barbie can be organized with these nifty tools! Q: My linen closet is so stuffed full, it's hard to keep it neat and find anything. Any suggestions for keeping it better organized? - Nancy Y. A: First, try paring down the amount of linens you have. A good rule of thumb is 2 sets of sheets per bed MAX and 2 sets of towels per person MAX. Next, if there's room, consider storing towels in the bathrooms, sheets in the closet of the bedroom where they will be used, and table linens in the dining room sideboard or china cabinet; reserve the linen closet for bulky blankets and extra pillows. If all else fails, use shelf dividers like the ones pictured below to keep piles from toppling over and remember that folding neatly saves space.